You’ve seen it, right? A big red or blue patch of color in your image that doesn’t belong there. If you’ve seen it, you definitely have wondered, what the heck is this?? Well, that’s the clipping feature in Lightroom telling you which highlight areas of your images have no detail (red), and which areas of shadow have no detail (black). 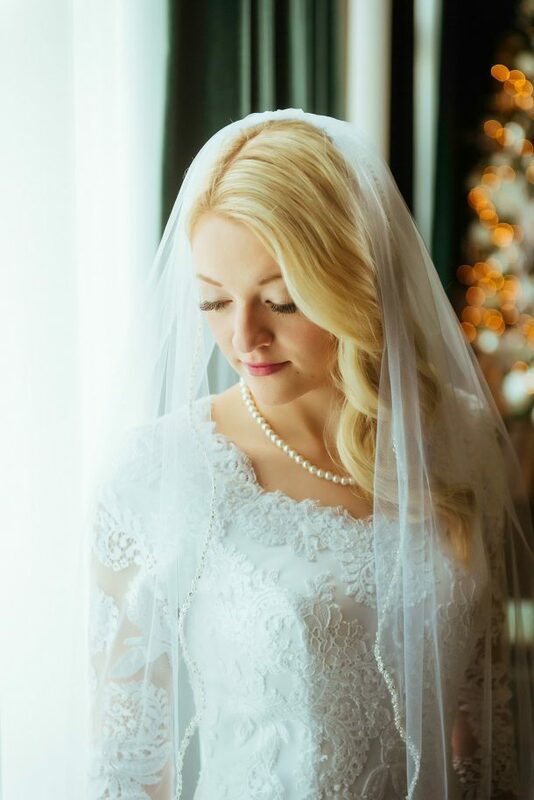 Let me help you understand why clipping is necessary and how it can help you create impressive images. 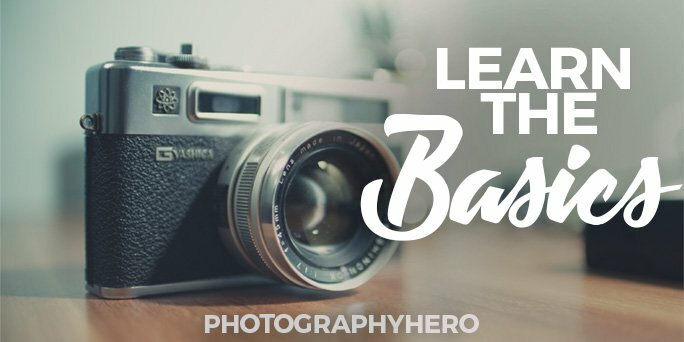 Check out my video that helps you understand clipping in Lightroom and read the article to dive deeper. 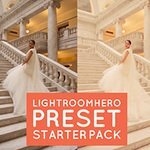 Hey guys I’m glad you’re here today, hey I just want to quickly talk to you about how you can easily straighten your images in Lightroom with one click. If if you’re like me you tend to shoot a little crooked. I’m more focused on the subject on the expression on the capturing emotion more so than I am to kind of get that picture to be exactly straight with the lines that you see in the image. I’m definitely not a tripod shooter that tends to slow me down tends to make my work more stiff and less kind of engaging. And so if you’re like me what tends to happen as you get back and you have a lot of images that are just a little bit crooked in any which way. And I find that a lot of my images are that way. And if, if I go ahead and straighten each one with the crop tool it can take a good amount of time a fair amount of time when I’m doing it you know on almost every image in the shoot. But what there is in that light room is the transformed panel and if you’re using an older version of Lightroom it is under the lens correction panel not the transformed panel. But here let’s just go into Leitrim real quick here I’ve got a lot of images that are crooked to a little bit to a certain extent and you can see that it just kind of bothers the eye. Now there might be one or two down here maybe this one here that I want to have crooked. But for the most part these are just a little bit crooked and it’s my fault. I should have lifted my camera just a little bit an angle a little better angle to fix that. So if we go into the develop modulus and want to go to him let’s go let’s go to the first image. Let’s go to this image right here. If we go into the develop module I have already got the transformed panel open. This is where you’ll find it. Like I said if you do not have a transformed panel it will be in the lens correction panel. That means you’re just using an older version of Lightroom. But if I come over here you have these you have these transformed buttons up top here. And these are what I’m talking about if you click these these will help straighten your image based on what Lightroom sees as the strong lines in the image. Now if your image let’s say it’s outside and it’s in nature and there’s just trees and you know they don’t grow straight they grow a little bit of an angle. These buttons aren’t going to work. So these are these are going to work in places where there’s architecture or strong lines a strong horizon line would work. And that’s why I’ve selected these images in Lightroom that I’ve picked. But if you come here into the transformed panel on this first image and you hit the level button you’ll see that it straightens my image so I’ll undo that and then I’ll redo that you can just hit off and level and you’ll see how quickly it straightens that image. Now I have three images from this session right here and they are all crooked in a little bit different of a way. So if I select them and sink and let’s say I go into my transform here and I have all three of these selected if I hit synchronize what it’s going to do is it’s going to take that an amount of straightening and it’s going to add it to these images and that’s not what we want. Because obviously those haven’t been straightened correctly so if I undo that if we go into sync settings you’ll see three options you have upright mode upright transforms and then transform adjustments. OK. So the first one let me let me go back into my develop module. The first one upright mode will be whatever is these buttons. OK. So so if I have this one checked it is going to send whatever with these buttons are picked across the other images. This upright transforms. If that one is checked it’s going to send everything that has been currently transformed onto your other images. So I do not want that one checked and if you’ll notice the upright mode comes on grade when I select this button right here. So what that means is now Lightroom on these other two images from the same session is going to evaluate each image on its own and apply the level transform that I have selected here. The last one the transform adjustments now that are that are that these sliders and that’s also this constrain crop down here. So if I was to have that on whatever adjustments I made here and if I have the constrained Krop checked which I’ll talk about in just a second. It will send that across those images as well so I’m going on check that and the first one. So the only thing that’s going to come across is this level button of the upright mode being selected which means these other three images will be evaluated on what what they’re crookedness. So let me go first off into the library module so we can see it happen. And let me sink. The upright mode from this image to these images and watch this line right here especially on this one. Watch how it straightens based on what it needs not what this not on how this one was straightened. Katie you see that so now that image is completely straightened and I didn’t have to go in and crop it. In fact all three of these images were shot in the same place so so I could honestly take these two images I could reset them completely. So they’re back to to how they were raw. I can come in here and check all but if you’ll remember I’ve got to turn these off. OK. And now you’ll see that not only does it synchronize the the contrast the exposure everything that I’ve done on this image. It also is synchronizing the straightening of the image. So those three images to work on took me as much time as it took me to edit this one image and if I’ve got 15 in the same spot that just saved me a ton of time not having to come in and straighten each one of these images independently. So let’s move down a little bit and let’s look at some other ones. Let’s look at the Senior right here. We’ve got all of these images that are crooked Now some of these you know I might I might like to leave crooked so you don’t have to do it all the time but. But if let’s just do it really quick. I’ll go in the develop module here. I’m going to straighten this one by hitting the level transformed button. That one is now fixed and straight into if I come back into the library mode so you can see what’s happening I’ll select all of these sync settings. I’ll make sure the upright mode is just selected and then I’ll synchronize that across all of these images. So let’s go into them so that one is straightened. Now this one didn’t straighten properly so if let’s go we go on the develop modules sometimes Lightroom can get it wrong. And you’ll notice that there’s an update button here. If I click that it will fix how I got it wrong. Let’s go to the next one. That one looks fine. So to this one. That one looks pretty good as well. And let’s finish with this one. So by a few clicks of the mouse a few button clicks. I was able to straighten all of these images. OK. Same thing. Same thing down there. Here we can even move through different sessions. So if I come here and straighten this image OK so I can now sync that across images even from other sessions. Upright mode and it will straighten these images as well. OK so all of those were strained. Now there’s something called in the transform there’s something called the guided transform and here’s where you draw lines on the image to get the straightening that you want. Now you’ll notice on this one that I have a lot of bit a lot of lines going a lot of different directions and so you get a total of four lines that you can straighten. So if I choose this one I can straighten that one. I can straighten this one I’ll choose two horizontals. OK it’s starting to work. And then let’s maybe go to this one here. And then let me go to this one here. So there we go so I’ve used I’ve used the guided transform now to straighten this image. You cannot sync the guy to transform across because all it will do is it will sink. This same transformation to the other images which isn’t going to work I’m just showing you really quick how to use the guided. Last thing I want to show you is the transform adjustments with the constrained crop so let me come let me come to this. This girl here. So let’s straighten this image. So I click on level k that one is correct and I’m going to sync it across all of these images. Fact. Let me go to the library module so you can see this how it happens. OK. So if I sync across all of these images you’ll see that some don’t get adjusted correctly case so take a look at this one you’ll notice that it fixed it with these lines. But it left this white kind of border around in K and that is where that constrain crop comes into play. So if I had that clicked it would automatically remove those white borders for me. But the problem with that I go into the crop tool is you’ll notice how high up her leg. It has cropped so it may not be exactly what you want. Whereas if I bring this in just a little bit I can drop this down and get some of her foot back. But you can see I shot it in a way that I’m going to lose some of her foot anyway so maybe leaving it at a bit of an angle is the better thing is the better way to do this. But the key to that so you’ll see all of these have that white kind of border around them. And we go into the library modules so you can see it better. So what I can do is if I sync my settings and I include the transfer I don’t think I have it turned on hold on. Oh I do. OK. So the constrain crop is turned on if I go into the library module and I sync settings and I click on transfer adjustments you’ll see all of these white areas disappear. And that is because now I am sinking across this constrain crop. OK. Now this one didn’t get it right. And remember if it doesn’t get it right you hit the update button and then it should it should snap it back to where it will be. These ones are not cropping 100 percent correctly because I’ve been in preparation for this video. I I was kind of making sure that the level worked properly. And so what it’s doing is it’s defaulting to one of the ones that I had before. But on yours it should get it right most of the time. If it doesn’t hit that update button and that should fix it. So there you go. I use this all the time. So when I sync settings from another image to sync settings from one image to another I will have this turned on and these turned off unless I want that constrained crop left on. And then I leave that one on right there. So hopefully this will speed you up as you add it. Hopefully it’s a tip that can benefit you and we’ll see you next time. Thanks. Subscribe to my Youtube to be notified of the latest videos. 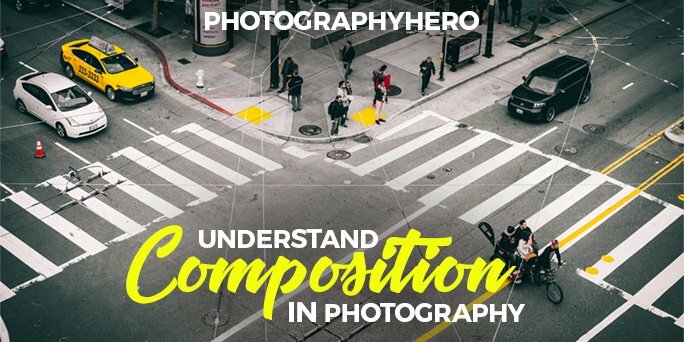 In technical terms, clipping occurs when Lightroom detects a lack of digital information in a portion of your image, meaning those areas that show up with the red or blue overlay have no visual detail. When displayed either on the web or in print, those areas will appear pure white or pure black. To understand this, take a look at the image below of the tulips. 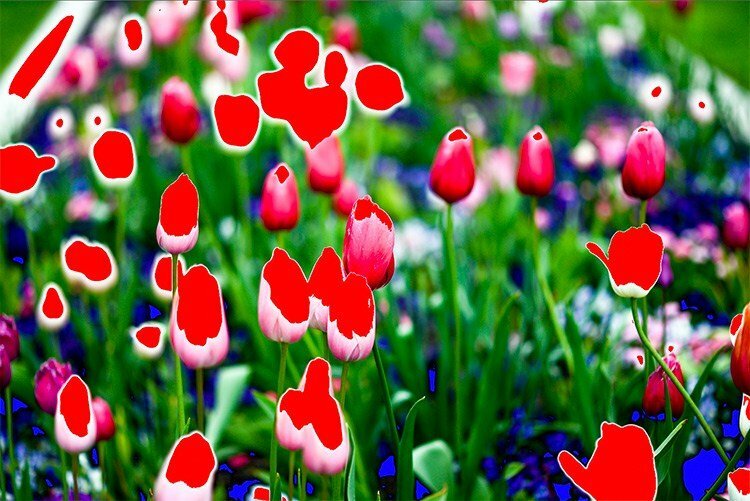 In real life, the tulips in the image are not white with red blotted on them; they are pink. And, in the darker areas, you’ll notice blue. The dirt is not blue! It is Lightroom telling me that there is no detail in those dark areas. Lightroom is using the red and blue overlay to tell me that there is no detail in these areas of my image. If I were to print this picture, the areas with the red overlay would be pure white, and the areas with the blue overlay would be pure black. Take a look below at the same image of the tulips with the clipping in Lightroom turned off. Notice that there is no detail in the top half of the pink tulips? That is the area that was previously covered by the red clipping overlay in Lightroom. Those areas covered with the blue overlay in Lightroom have gone completely black. As you look at the image of the tulips, hopefully, you have noticed that it is not a very appealing image. A lot of contrast, with areas of bright white that should not be bright white. 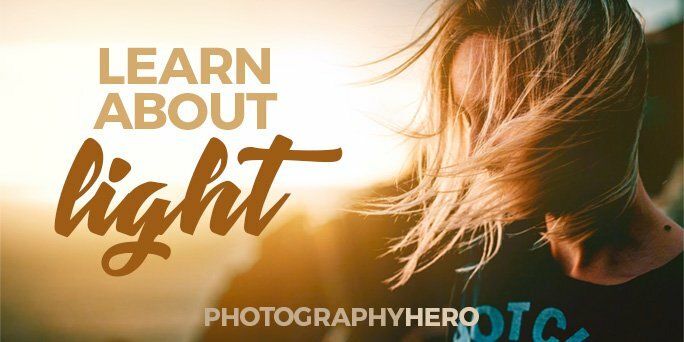 As you being to understand clipping in Lightroom, you’ll realize just how useful this feature is in helping you to create more pleasing images. The image below is an example of when clipping may not matter as much. Take a look, and tell me what you think. 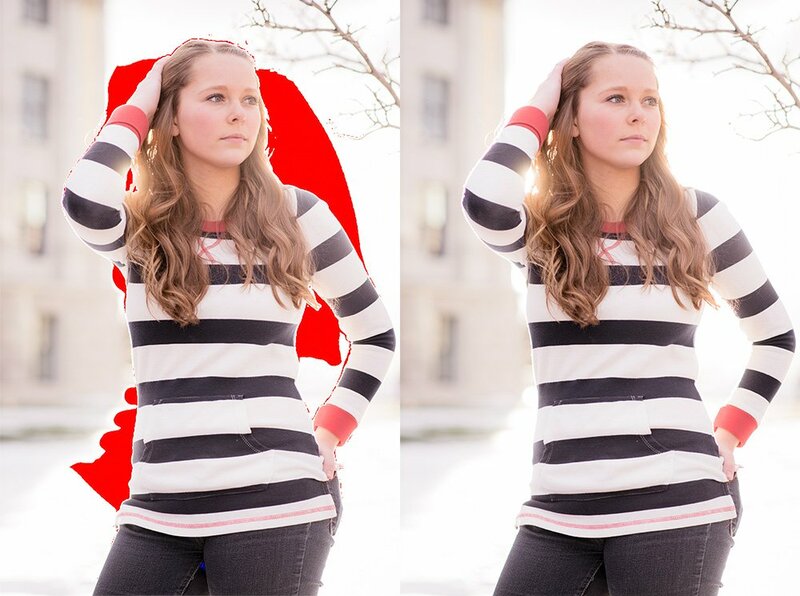 The image on the left and right are identical; the left simply has the clipping mask in Lightroom turned on, while the picture on the right has the clipping mask turned off. Should I concern myself with the clipping in this image? This photograph has a pure white sky that enhances the picture, in my opinion. Therefore, leaving it that way will yield a great finished image. The clipping overlay in Lightroom makes it easy to see if clipping is occurring in your image, but it is not the only way. 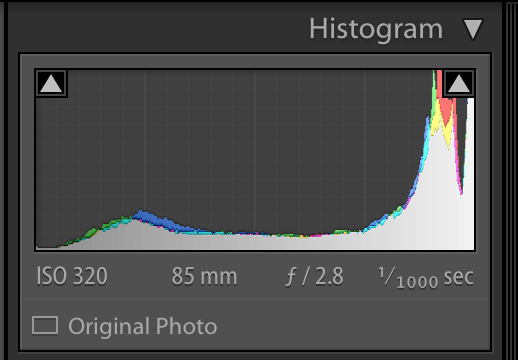 The histogram panel in Lightroom is where to come to see if clipping is occurring. This panel is also the place to turn the clipping overlay on or off, which we will cover a little later. The histogram shown below is the exact histogram for the picture of the girl above. On a histogram, the mountains represent the luminance or brightness of each color channel. The left side of the histogram represents dark tones, the middle area represents the mid-tones, and the right side of the histogram represents the highlights. You’ll notice that most of the mountains spike on the right side of the histogram. This tells us that the image has mostly highlights or brighter areas in the picture. Which makes sense, as the image of the girl is very bright in tone. 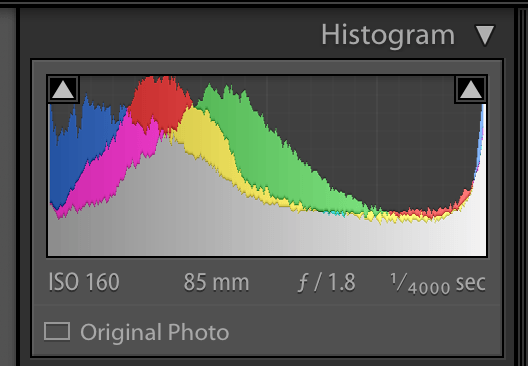 As you look further, you’ll see that the luminance mountains touch the right side of the histogram, cutting it off. When this happens, a luminance mountain touching the right side of the histogram, you instantly know that there is highlight clipping in the image. The part of the mountain cut off (or clipped off) by the side of the histogram is that part of the image that becomes pure white and has no detail. To fix this, you would lower the exposure, highlights or whites sliders. Doing this will lower the brightness of the highlight areas of the image causing the luminance mountain to shift to the left. 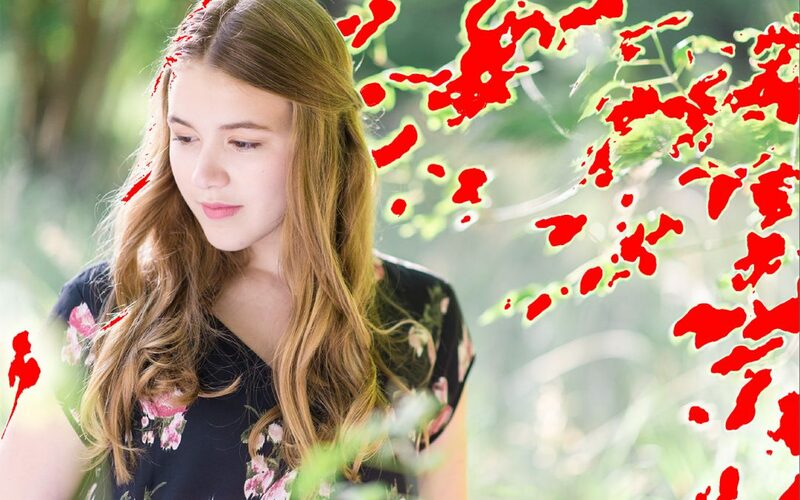 Remember, however, this is the histogram of the girl pictured above, and I find the white area pleasing to the eye, and therefore I would not adjust this at all. Clipping works for some images and for others, it will ruin the image. 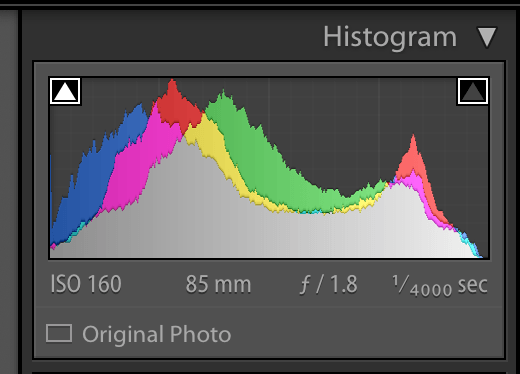 Referring back to the image of the tulips, take a look at that image’s histogram below. Remember, in that image we had both highlight (red) and shadow (blue) clipping occurring. You can visually see that happening in the histogram above, as the luminance mountains are cut off on both the shadow side (left side) and on the highlight side (right side). The luminance mountain touching the left side of the histogram tells me that there are areas in the image that are completely black with no detail. The luminance mountain touching the right side of the histogram tells me that there are areas in the image that are pure white with no detail. On the image of tulips, I do want to fix this. Let me help you understand how to correct the image. To remove clipped areas from your image, you adjust the sliders in the basic panel. If the highlights are clipped (red areas), then you would adjust the highlights and/or the whites sliders. The exposure slider can also be adjusted to remove highlight clipping. In the video above, I demonstrate this for you. 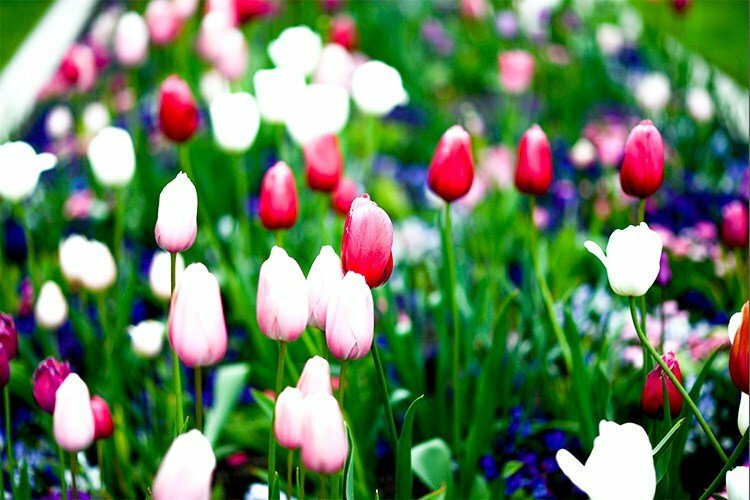 Take a look at the image of the tulips below. It is the image after I adjusted the whites and highlights sliders. When dealing with skin tone, be careful when you adjust these sliders, especially the whites slider as it will flatten out skin tones causing the skin to look plastic and fake. Watch this video on clipping to understand what I’m taking about. The histogram for the adjusted tulip image is below, and you will notice that the luminance mountains no longer touch the right side of the histogram panel. To remove clipping in the darker areas of an image, you adjust the shadow and blacks sliders. You can also adjust the exposure and contrast sliders as well. As you raise these sliders, brightness is added to the dark areas and brings detail back into the shadow areas. Now that you know what clipping is let me teach you how to turn it on and off. The easiest way to turn clipping on and off is to press the J key on the keyboard. Hitting the J key will cycle the clipping mask on and off. 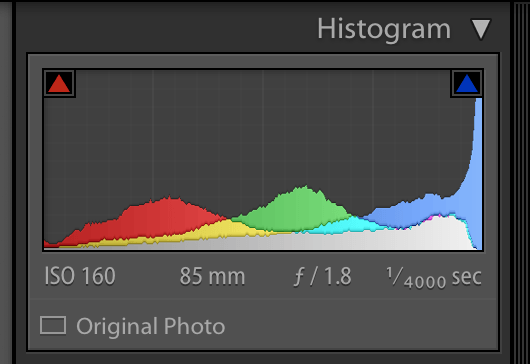 You can also tell if it’s on or off by looking at the triangles in the top corners of the histogram. When the triangles have white boxes around them, then clipping is turned on. When the triangles do not have white boxes around them, then clipping is turned off, like the image below. You can also turn clipping on or off by clicking the triangle itself. To turn clipping on or off ONLY for the shadows, click on the triangle in the top left corner. The image below shows that clipping is on only for the shadows (the blue overlay), while highlight clipping (the red overlay) is turned off. To turn on the clipping mask only for the highlights, click only on the triangle in the top right corner. The image below demonstrates that highlight clipping (red overlay) is turned on, while shadow clipping (blue overlay) is turned off. Another trick to quickly seeing the clipping currently occurring in your image is to hover your mouse pointer over the left or right triangle without clicking. Doing this will quickly show the clipping that is occurring in the respective area you hovered over. This hovering trick can be a fast way to check for clipping without turning the clipping mask entirely on. You may notice that on some images, the triangles are different colors. There is a reason for this; Lightroom is telling you which color channel is getting clipped. Take a look at the histogram below. Notice that the right triangle is blue and the left is red. This is telling you that only the blue channel has highlight clipping and only the red channel has shadows clipping. So keep an eye on those little triangles to help you understand a bit more about your image and what is happening to the highlights and shadows. So there you have it! Those blue and red overlays aren’t telling you that your image is ruined, but simply helping you to be more aware of what is happening with the shadows and highlights within the image. As you understand clipping in Lightroom, it will become your friend and help you edit your images more precisely. 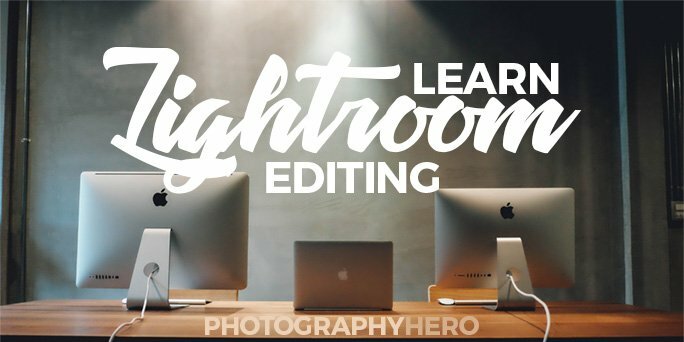 Clipping in Lightroom is just one more way Lightroom helps you to edit your images and speed up your workflow.